Merle Wood & Associates is pleased to announce that the SYCARA IV yacht sold this week to a discerning yachtsman. Accommodating 9 guests in 4 staterooms, this modern take on a ’20s-style classic includes a luxurious master stateroom on the main deck, with three lavish guest staterooms on the lower deck including a centerline VIP suite aft, plus 1 double stateroom and 1 twin, each with its own en suite. Winner of the 2010 ShowBoats Design Award, she has a beam of 26.6’ (8.1m) and a draft of 6’ (1.8m). She also accommodates up to 7 crew. The SYCARA IV yacht sold as one of the most popular classic yacht re-creations, and with the pedigree of a Burger, she was no doubt built with integrity. Custom-built at the Burger shipyard in 2009, her interior design is by Craig Beale of Pure Detail and Ken Freivokh, with exterior styling by Bruce King. Interior woods including Madrone burl and Macassar ebony give her a classic look and a warm, inviting ambience. With furniture arranged to form elegant social areas, her main salon features a large flat screen television and a bar flanked by custom-crafted stools. Her enclosed formal dining room benefits from large windows and abundant storage for utensils and other dining essentials. The SYCARA IV yacht sold with a vast sun deck featuring a raised Jacuzzi for up to 7 guests, a centerline table with chairs for casual dining, and a bar with built-in stools. Her main deck aft, located just above the fantail has a large dining table for al fresco meals. Classed to ABS standards, she has striking, classic mast stacks that are removable for navigating low bridge clearances. Powered by twin 600hp Caterpillar engines, she cruises at 10 knots, with a top speed of 14 knots. At 12 knots, she has a range of 4,500 nautical miles. We would like to thank the corresponding brokers who assisted in the marketing of this vessel. 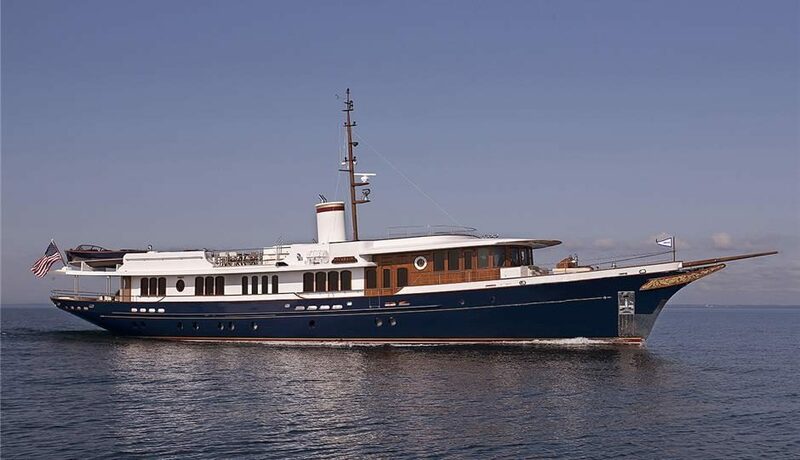 Congratulations to luxury yacht broker Merle Wood on the sale. For more information on motor yachts for sale that are similar to SYCARA IV, please contact Merle Wood & Associates. As a highly respected and successful luxury yacht broker, Merle Wood has been working his craft for over 40 years. Together with his team at Merle Wood & Associates, he has amassed over USD 30 billion in cumulative closed sales, and has traveled the globe for the purchase, sale, construction, and charter of the most prestigious yachts worldwide. For additional information, read the full SYCARA IV yacht specs or view the SYCARA IV yacht price and details. For information about the SYCARA IV yacht, or for expert knowledge from a qualified yacht charter broker, simply contact the luxury yacht brokerage firm of Merle Wood & Associates for assistance.